The new generation Honda Fit does not have any drastic changes from previous years, but that's fine with most fans of this popular hatchback. Taking a look around the vehicle, the most obvious difference is the front end design. A redesigned grille with the Honda emblem in the center is very noticeable. Slight differences in the front bumper and roof spoiler are also evident. Headlights are constructed with new LED technology and the Fit will sport 16 inch alloy wheels. There are several new choices for exterior colors. The keyword here is "slight." All the changes are just geared to streamline the appearance without changing the basic look of the vehicle which is already one of the most popular in its class. The power train options include a 1.5 liter engine and a hybrid version which produces a respectable 150 horsepower. The inside of the 2016 model also uses minor modifications to upgrade the general appearance and improve comfort. New detailing and soft plastics are immediately noticeable in the cabin. The seats are high quality and electronics are up to date. A 7-inch touch screen display, Bluetooth and USB capability, climate control, and navigation system to provide you technology, comfort, and entertainment – the perfect Fit for every drive. 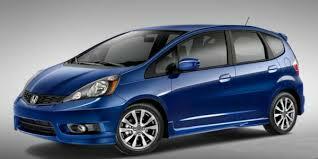 Honda has taken a great idea and made improvements to bring the Fit close to perfection. If you are in the market for a vehicle in this class, be sure to explore the various options available with the Honda Fitfor 2016 at the Olympia Auto Mall. The Olympia Auto Mall – More Cars, Less Money!!! 2016 Kia Forte Sedan – Just $16K? No Way!